If you are wondering if a narcissist is ever sorry for the hurt they cause or how they make you feel, then the answer has to be, ‘no’. They simply don’t care how their behaviour makes others feel. Remember, it’s all about them, their feelings and their needs. These disordered individuals feel that they are above reproach. If they behaved badly, then it’s somebody else’s fault. Narcissists are delicate souls who fail to take responsibility for their conduct. They can’t accept criticism or blame but instead shift blame onto others. By shifting blame the narcissist will protect their ever so fragile ego from bruising. They are terrified of looking too deep within themselves, to accept the shame of recognizing who they are. Self-reflection is avoided at all costs. To be sorry for their behaviour would be tantamount to admitting that they were wrong and that’s not going to happen. 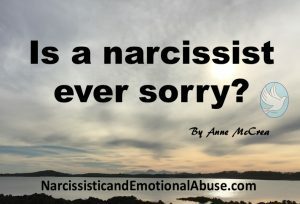 So what, you may ask, will a narcissist be sorry for? They will be sorry that they have been found out, that you figured them out for who they really are. That wasn’t supposed to happen! They will be sorry that they will lose control over you. Narcissistic supply is vital for their wellbeing and if you were a good source, the subsequent loss can be devastating to someone with such precarious self-esteem issues. Narcissists don’t do solitude so if you decide that you have had enough and leave them to their delusional hell, their world may disintegrate. So yes, they will be sorry. I am sure you get the picture now. 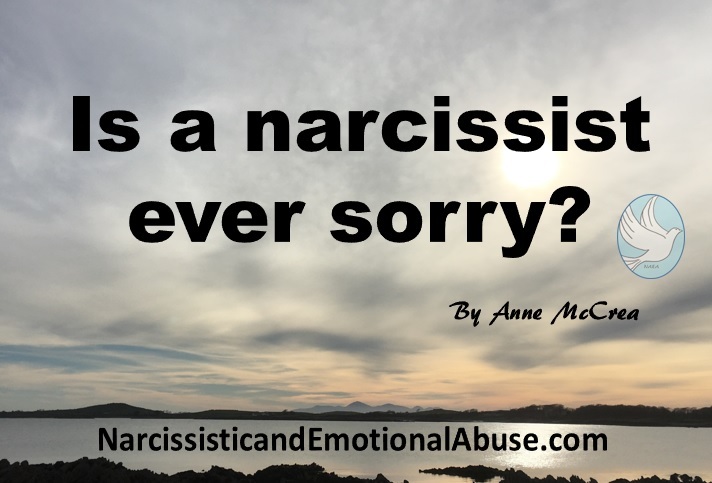 The narcissist may be sorry but those ‘sorrys’ are reserved solely for themselves. How do you deal with a narcissistic mother? my narc-ex is 53 years old. within months of us breaking up, he had a 29 year old girlfriend. He dosnt work so much anymore, drinks I’m told all the time. is that guilt for the stuff he has done to me and my family? Fabsolutely not. He has the life he wanted. No responsibility. About 32 years ago, I found myself and my then narc/wife in the office of the fifth family therapist I hired to try and save our marriage. “What is the one thing you’d want from her,” he asked. I said that we had been married for seven years, and never once has she apologized for anything, for any of the awful things she’d said or done. In fact, she’d distort the facts so that she would present herself as the victim to justify the very things that she herself had perpetrated. I just want to hear her say that she’s sorry for something, anything. The therapist looked to her, and she responded: “I’m sorry … for the way you feel.” And that’s when I knew I couldn’t stay in the marriage any longer. Fast forward to a few years ago when our son got married – so much drama and lies at the wedding. She’s still the same but older, still single, still entitled and most definitely still abusive. “I’m sorry you feel that way.” …. repeated over and over again! I get it now! I was put through the idealize, devalue and discard phases. It wasn’t until our wedding night that the mask dropped. It was the first time I was scared of him. When I finally figured out he was an Amazing actor and a Narcissist ,his response was…..I DON’T CARE. He wasn’t sorry for anything. My narc/husband is so good at the gaslighting part of narcissism that he turned my kids against me,he convinced them that I’m the bad one,he manipulated me and them for years,and now that I’m trying to get out of a 26 year marriage because I finally understand what has been happening to me and them I am looked at as if I am the bad one for giving up on the marriage and finally putting myself into priority.I was so badly manipulated that I developed bipolar disorder and severe anxiety and depression,narcissism is no joke! And to be a victim of it is life altering. I was raised by a narcissistic mother. Real Jeckyl and Hyde type. One part really caring and nurturing. The other part just horrible. Finally, at 53 I’m really getting into repairing the self esteem issues it caused. I’m just thankful that she had that good streak as well. No she is the opposite of sorry, she seems to take pleasure in her selfish behaviour and has everyone she speaks to convinced that she is the victim, despite me having documented and video evidence of her abusive behaviour.